My wife’s Macbook is officially two weeks old and all indications point to a new member of the Church of Jobs. She has taken to the Mac like a duck to water. I’ve noticed that she’s not afraid to tinker with the Mac’s many features. She only needed me to show her some basic stuff from the first three days and after that it was her, unguided, all the way. She even pushed me away when she said she wanted to play a CD. She said she can figure it out. I think that the Apple OS is really the every-OS. The configuration is just easy and there is a wide room for error. Compare that with Windows where an untracked error could spell disaster at some point. It’s like walking through a minefield–and only those with a preternatural ability to memorize Windows quirks can navigate it with a degree of confidence. My father-in-law is the perfect example here. He believes that he is one of these people but, unfortunately, he is not. This only means that his PCs conk out after a mere two months. I’m quite happy my wife is having fun with her Mac and just to join in on the fun, I just might get one myself next year. My broadband provider gave us the shittiest, most temperamental WiFi modem-router I have ever encountered in my life. It’s so temperamental, my PS3 always gets disconnected and my wife’s Macbook suffers from the same problem. 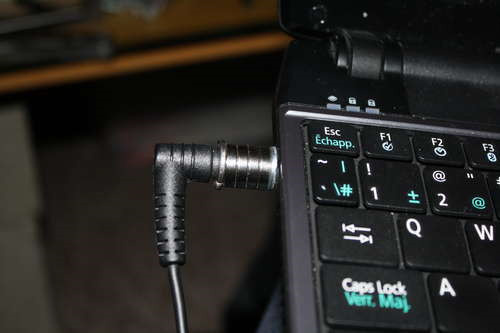 Any device that goes out of a four feet radius gets wonky connections, and this includes my Nintendo DS and my ASUS EEE (yes, I have THAT kind of a home). I finally had enough of the router and decided to get a new D-Link WiFI draft N router. Prices for the N routers have dropped significantly that I thought to myself that it would be a good time to try it. Setting up the D-Link was a breeze. But the best bit is that my wife doesn’t mumble under her breath anymore everytime she gets disconnected from Perez Hilton. Non-Macintosh users, you can make your own MagSafe Power Adaptors Too! What a difference 2 years make. Last time I posted here, I was no Apple fan. Today, little more than 2 years later, my unibody MacBook 2.4Ghz has replaced the NASA desk. That’s right, only a 13″3 monitor with 1280px screen estate width. At home it is simple and I can easily connect to an external 20″ monitor when I actually want to sit at a desk.